Quite a few issues have come up lately on Facebook so I thought I would bring them to light, explain them a little and advise on what you can do within these situations. I am talking about situations like cloned Facebook accounts, hacked accounts, posting from your page you didn’t do, credit card access and that sort of thing. Please review these and share them with your friends so we know how we can help each other. Plus feel free to share others you know of and I can update this post in a month or so with more! We HAVE to help each other out from hackers and spam! This is one of the more common and biggest things I have come across lately. 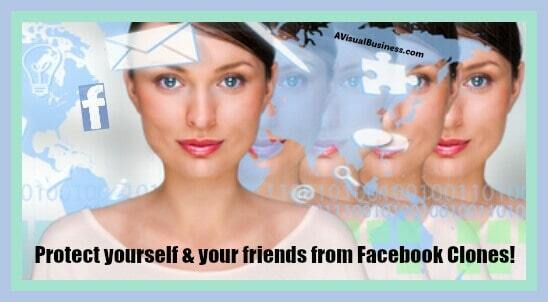 I have had several friends who have had their Facebook cloned and this isn’t to be confused with being hacked. It is fairly common so don’t think you were specifically targeted for a reason. When your Facebook profile (typically personal profile) gets cloned, it’s just that, it is duplicated. The person doing the cloning takes your profile and duplicates it. This is public information so they didn’t hack your account to get that information, it’s public! That means they are using YOUR cover photo and profile photo, copying some of your images, saying they live and work where you are, and then start going to work. When I mean going to work, that is inviting your friends to like them… or is it you? That is the catch, they want your current friends to not think twice and just add them. Then, what they usually do is message them and try to get them to give them money or whatever. Check em out – the easiest thing you can do is, when you get a new friend request, check them out. If you thought you already were friends, go and do a little search to see if you and Jane are already friends. If so, this sounds like a clone and I bet that both profiles look the same too, huh? 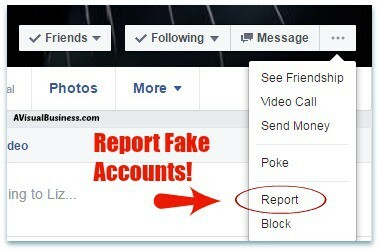 Report them – Go to that cloned account, click on the 3 dots (desktop) and a drop down opens up, click on Report and follow the prompts to report this cloned account to Facebook. 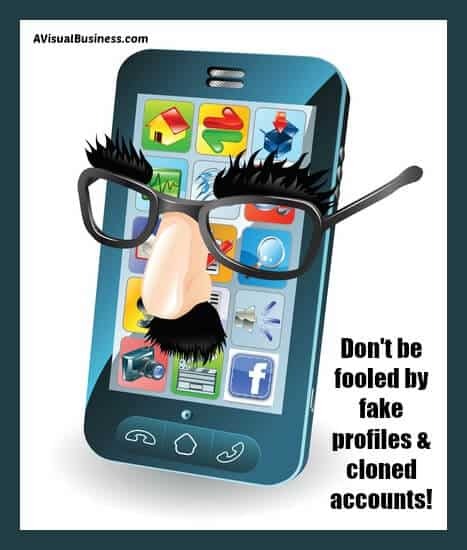 Help your friend – I like to screen shot the cloned account and share it on my real friend’s profile and say, hey Jane, your account was cloned. Hopefully the friend will comment this is the case and tell all their friends NOT to accept another friend request from them, it isn’t me! Confront them – I have done this.. gone to the cloned account and said, hey, I have reported you to the real Jane and to Facebook.. so be gone! Report, Help and Watch – the account will likely disappear pretty quickly… but note, they will pop up cloning someone else so just know who you are friends with. DON’T go by the mere fact that this cloned account (currently unbeknownst to you) and you have mutual friends. That just means that they got fooled too. Don’t be a fool, check on who you friend. Don’t take it just cuz you have ‘mutual friends’. If you are hacked, that usually means that it appears that YOU are posting, but you aren’t the one that is posting to your account. It is likely done to share content that you wouldn’t normally share (read: spam). A restaurant client of mine had a post of shoes for sale (in another language) come up on her page and followed by several comments of “new followers”, also in another language. Change your password – If you still have access to your account, change your password. If you don’t, you might have to do that ‘lost password’ attempt and hope they didn’t change your email address too. Review your content – if hacked, likely you had content that was posted, on your behalf, but without your approval or knowledge. You would want to remove this from your page pretty quickly. You might want to screen shot the content should you ever need to review it later, otherwise Delete away! Check your recent likes – if you were hacked and had content posted, it likely came with extra followers who helped to promote the content. Check out your recent likes and block them if you need to. They are crap followers anyways and you don’t want them anyhow and helps to keep them from doing anything new by making it difficult for them to find you. Credit cards – If you have credit cards associated with your personal account – you might want to remove the credit card temporarily, monitor your recent charges and contact your credit card company or bank. Give it some time after your password changed and get back to business. Know this, your credit card is attached to a personal profile, not to a business. When businesses run Facebook advertising, the person who does the work will be the one who pays for the ads. For example, that restaurant client I mentioned above, she asked if I ran ads for her. I can’t run ads for a client under their credit card that they have on their account, even if I have access to their Facebook page. So, I told her what to do about her credit card safety and explained the above, we were able to stop it before it spiraled. Same as above, know that only you have access to your credit card since it is attached to your personal profile. Therefore, changing your personal profile password occasionally isn’t such a bad idea and of course, keep track of your credit card transactions by reconciling your account every month. Safeguard your profile, your pwds, share w/ friends & check em out before accepting new requests. Hopefully these have been help tips to help you protect yourself and your friends from cloning, hacking and charges on your credit card. Should you have any questions, please let me know as I would be happy to help you with these issues or other social media marketing. Otherwise, let me know other issues that you have had in the comments below and again, SHARE with your friends so we can all be protected on social media! This is great advice, Kristen. It can be quite scary and stressful for a business to deal with this. I bet your clients really appreciated your assistance in clearing this up. I’m glad you mentioned the credit card connection with Facebook. Not many small businesses remember this. Thanks for sharing. This is GREAT info, Kristen! So many of my FB friends have been cloned of late . And like Sabrina, I, too thank you for sharing the part about credit cards and FB. Will definitely monitor! Thank you so much Susan and sorry that your FB Friends have gotten attacked, hope you are now well versed. Such important advice in this, Kristen. A friend of mine recently had her FB account cloned and found it really distressing. It’s an absolute pain to change your password regularly, but so much easier than dealing with the results of cloning and hacking. Yes Tami, it is easier to change our password than to deal with identity theft, hackers or the like. I didn’t realize that cloning was different than being hacked. I have come across a few people who have been cloned. Thanks for letting me know I can report them. Yes ma’am.. they are different and now you understand it a little better Karen. Thanks! These are really great tips! Sadly it happens quite often and people don’t know how to deal with it. Now they do – I will be sharing this with others. You are right Stacey, it is quite sad.. but thank you for sharing to spread the word. My sis-in-law was recently cloned but a sharpie friend caught it early & we were all warned. The friend reported it too. I had never heard of tthis Super important info in this post. Thanks. Sorry to hear that but glad you two were diligent Roz. Absolutely brilliant advice here, thanks Kristen. I’ve tweeted this out to clients so that people don’t get caught out. It’s scary how often hacking happens! It is scary how crazy hackers are. Thanks for sharing on Twitter.. how they see it for Facebook too Sonya. Thanks! Wow! Now I know how to protect myself! Thank you! Yea, I hear you Becky and my profile is public… so while I don’t know if I have been cloned, but I am surely more vigilant about who I friend, that is for sure. Great points Becky! This is fabulous feedback. I report double profiles too. I get so many friend requests and do my best to discern real from fake. This is great information. Thanks! I used to not worry about it and just accept them, but then it became a bigger deal and now I seek them out a little better before accepting Tandy. These are great tips. I’ve been hacked, but not cloned. However, several of my family members who are not tech savvy have been cloned and they FREAK OUT when it happens. The sky is totally falling. I’m so glad to have a resource to walk them through what to do step by step. Thanks so much! YESSSS Jennifer.. share it with the world. Most of what I have seen are cloned accounts and everyone says.. you’ve been hacked you’ve been hacked when all it is are cloned accounts.. chill people, report it but sure, change your pw, that can’t hurt. I can always count on your blog for useful and timely advice. Love your tips in this article Kristen! Awwww, thanks Vickie… glad to help. Holy Cow. There are so many ways that hackers show up. It pays to be wary of ANYTHING that doesn’t feel right. I appreciate the tips you provided to put a halt to this type of behavior. Yes, you are quite right Alene… so many ways… and whether we are prepared or not won’t change it… but best to be aware. Excellent posting. Love to pass this on – Was not aware of some of the pitfalls. I already implement much of your post. I feel it important to use this space for those I do know. Having #’s is not my intent. Having quality is. I want to know more of some people, and request to do so on FaceBook. As I honor them, they in turn honor me. That is an excellent practice Celea and glad you haven’t had many issues. Wow! I am scared to my bones. I didn’t know that it was possible to do that. I think I should be more careful with my account and the people I add as friends even when they have 500 mutual friends with me. Thanks for sharing this with us. Fabulous info and distinctions in this post, Kristen. I don’t think I know anyone who has been cloned, but see many people who have been hacked and very bizarre posts are being made on their pages. I usually report it immediately, but find they are deleted quickly as well. As far as credit cards, I don’t give that info to FB or any social media sites, so I am okay with that. It’s amazing what kinds of ‘dangers’ lurk out there in cyber space. Too bad we can’t all play fair and support each other, instead of attempting to clone, hack and steal from others. Thanks for the tips! You are right Bev, too bad we can’t just get along. lol I’m glad that you are smart enough not to give out your info as well. Very interesting! I did not know about cloning, and glad you spelled it out. Great information, and i will be bookmarking. Great info, Kristen, I shared on my personal profile. Last week, my niece asked to friend me. Strange, because we’re already friends. When I searched for her, I found 4 profiles with different pictures of her. I messaged her (continuing a conversation from a while back) and never heard back from her. Still not sure what happened there. We’ve all got to be vigilant. So true Meggie and while it can NEVER hurt by changing your password, there IS a difference. Thank you! I had not heard of cloning Facebook pages. Good info, thanks so much! Seriously Jill? Wow, lucky you… it’s been going on with personal profiles for a year, easily. Good information Kristen, A friend got cloned and I was able to warn her. It was a request for money of course – stranded in Spain with a sick aunt who needed immediate surgery. I knew enough about her to know this was all fake. Always a good reminder to be alert for the newest schemes. Thanks for keeping us out of trouble. So glad you caught it Joyce and knew enough about your friend… please share it! Why thank you Joan, so glad you saw the value as well! Yikes! Sounds like it’s really easy for this to happen! Thanks for the great tips on how to tell and what to do! Yes, it sure is Kimberly… sadly! Wow, Kristen I have also shared this on my Facebook page as I did not even know that this was a thing, I have heard of hacking before but not of cloning, who knew. Maybe we are a little behind on this in South Africa. Great, informative and valuable information. Be thankful Alison that it isn’t out there as much! lol Thank you for sharing! Yes, IT is pretty important these days Joan.. glad you are encouraging. Great Information for us non-techies! Thanks Lady!! Thanks so much for stopping by Maria… glad you found it helpful! I’ve been cloned before. It was very frustrating. Recently two of my friends were as well. Ughhh, that stinks Julie… but now you know about it and what to do. A friend recently went through this: Her account was literally cloned, and the faker actually asked me for money, saying she was stranded and all other crap. Was almost hacked myself, had to change to a longer password. Ughh, that is horrible Ima… and most likely cloned but never hurts to change a password. This is really great information. Thanks for educating us. With each day that passes there seems to be anew scam that pops up. This is a great read for people that might not be aware of these things. That is so true Gessell, sadly! Yikes, how scary! I’ll keep this in mind so it doesn’t happen to me. This is crazy! Ive heard of hacking but never fb cloning thanks for the heads up! Yea, no skill needed to just clone someone Mihaela! I have seen this happening more frequently! Scary stuff, thanks for the tips! That is right Katrina, so true, sadly! Important info, no one wants to deal with this type of annoyance! So sad that we even have to protect ourselves online. Ughhhh, I know Jasmine, so annoying! These things can be pretty scary! Thanks for the useful tips! Awesome tips! One of my cousins gets cloned all the time. I’ve saved this and am emailing it to her for the next time it happens. That is awesome and thanks for sharing Debra. I know I should but this is something I’ve given very little thought to. It’s scary to think that it can happen. It is Jill, luckily not as bad as being hacked. Wow this is insane and scary. I accept a lot of bloggers to my personal facebook account. I am going to be very careful who I accept for now on. Thank you so much for the information!!! That is true Glenda and best to be sure they have been active for awhile, not just friends of friends. I never knew about people trying to clone other Facebook accounts like this. Such a scary thought! It sure is T Coleman! i don’t understand the purpose of cloning every day regular people but, I’ve seen it happen to enough of my friends to know that it’s a serious issue. They do it Rain so they can solicit your friends and by saying I know your friends seems to give them a little credibility. Keep knocking on wood Sondra and it can be paralyzing for sure. It’s crazy what people do these days to cause panic or harass people. It’s awful and we definitely should learn how to fight back. These are very helpful tips! Yes, it is crazy Elizabeth.. and quite annoying for us good people. You can’t believe how crazy these people are for doing something like this to others! It’s important to be careful especially since they can fool your loved ones as well. Yes Carol, that is so true. Keep an eye out for your friends! a few friends have been cloned. i always tell them they weren’t hacked. luckily fb is good about taking them down. Yea, so many aren’t very tech and think they are hacked, but they aren’t, like you said Katrina. This has never happened to me, but it has affected a few family members of mine! So scary!